Hours for April 25th will be different. We will open at 1pm and close at 5pm. I got tickets to see Avengers: Endgame!!! Digital Worlds VR offers Tennessee the best experience for Virtual Reality in the Franklin, Cool Springs TN area. Perfect for birthday parties & corporate events. Prices for DWVR are per station, not per person. Parking is free. For more details on what a VR station is and includes, click HERE. Music notes are flying at you in Beat Saber and you must slice them with your saber to the rhythm of the electronic music. Can you beat our scores? Explore the entire Earth as you fly around and visit countries and see their monuments and landmarks, or visit your old home. In a world where robots have replaced all humans, step into the "Job Simulator" to learn what it was like 'to job'. Four hilarious jobs to pick like auto mechanic and culinary chef. Party games are always great for... parties, go figure. This is one of the best. One minute you will be balancing on a pig being guided by a carrot on a string and the next minute you will be shooting burgers out of the sky with a bow & arrow. An intense 360 degree racket competition in which you try to take out as many point panels as possible. Hit them hard enough and at the right angle and you can chain panels together. Face off against a horde of robots that will walk, run, crawl, and fly their way to fight you as you use one of four different classes. Scan, serve, & pack produce whilst shooting guns to defend your store from mutant fruit! A multi-tasking shooter only possible with VR. SCAN! SHOOT! REPEAT! In this tactical shooter, time moves only when you move. There are no health bars or ammo in SUPERHOT. Do you have the accuracy and dexterity to get through it alive? We respect your privacy. No emails are ever sold to any company. Only punks do that and we aren’t punks. Thank you! We’ll keep you updated on all things DWVR. If you’re really into Virtual Reality, then check out the DWVR Blog. Craig is pretty confident about some of his scores in certain games. 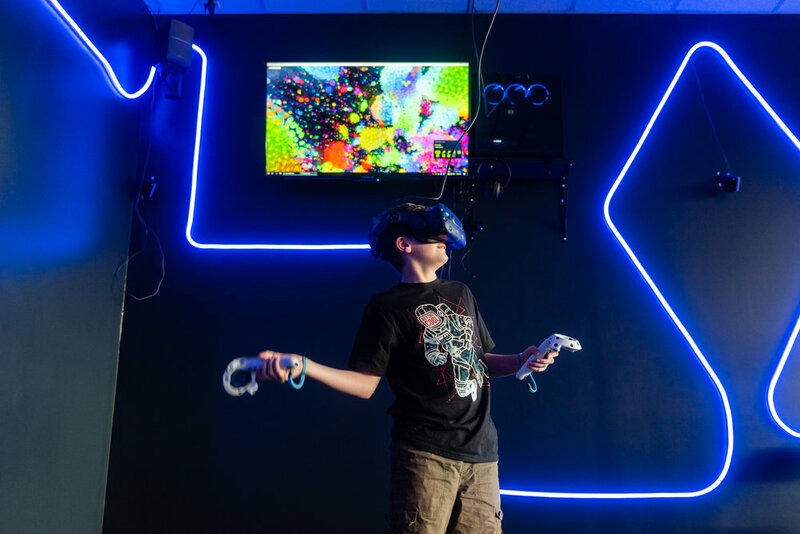 So confident that if you’re able to beat them while at DWVR, you will get a prize like 50% off coupons for an hour of VR or even a free hour long session of VR. While at Digital Worlds, if you think you've got what it takes, you can compete in tournaments put on by the Virtual Athletics League.